Earth day is approaching, which means it’s a great time to work on reducing your environmental footprint! People all over the world are joining the Zero-Waste movement, working towards producing no trash and living waste free. Why zero waste? Well, for starters the average American produces 4.48 pounds of trash every day! And since recycling isn’t a perfect solution and not everything is recyclable we need to find ways to consume less and reuse what we already have. While living completely zero-waste may not be attainable for all, there are still ways we can all reduce our waste! 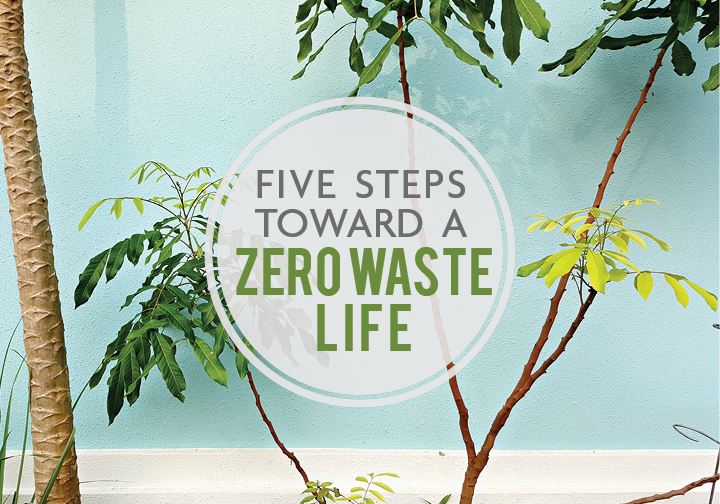 Check out our five tips below on easy steps you can taking to living a greener life! One of the easiest switches is ditching the plastic bags at grocery stores! Reusable bags are more durable, better for the environment and they’re so cute. And I’m not just talking about the plastic bags at the checkout counter – I’m also talking about the bags in the produce section! Place your produce directly in your cart and give them a good wash when you get home or make your own reusable produce bags. You can leave your reusable bags in your car, so you don’t forget. Once you get into the habit of remembering your own bag the switch is easy! Plastic can take up to 1,000 years to decompose in our landfills and makes up a huge portion of our everyday products. There are lots of items around your home you can switch from plastic to reusable items: food storage containers, straws, water bottles, snack baggies and more. Materials like glass, stainless steel and silicone are reusable, recyclable and more durable! Use up the rest of the plastic and non-reusable items in your house, then make the switch to environmentally-friendly products. We tend to throw items away when they’re broken, torn or worn out. Instead of sending an item to its death in the landfill, give it new life! There are lots of ways to reuse items around the house to give items a new purpose. Worn or town item of clothing? Refashion it into kitchen cloths to replace paper towels! Broken mug? Turn it into a planter to grow your own herbs! There are lots of creative ways to reuse items we think are goners. Shopping at thrift and consignment stores is a great way to reduce manufacturing pollution, production plastics and it helps save you money! People buy used cars all the time – why not buy used clothes! You can find some awesome and unique items at thrift stores at a bargain and when you find a piece you love it makes it even more special. And of Course, Take Public Transit! If you don’t already, ride our buses and A-train! It’s no secret public transit is better for the environment than driving a car, but did you know communities that invest in public transit reduce the nation’s carbon emissions by 37 million metric tons annually? So, hop on board and do your part to reduce carbon emissions! Visit our website to find out what routes are near you. And when you do ride, buy a digital ticket! Buying a paper ticket every time you ride can easily add up and become wasteful. Download the GoPass app instead. You can purchase your fare within the app, plan your trip and transfer to regional connections such as the Dallas Area Rapid Transit (DART) and Trinity Metro! We hope you enjoyed our tips on living a greener life. Good luck on your journey to reducing waste and remember, it’s okay to make mistakes. Not everyone goes green at the same pace! Comment below on your favorite tip and one you think we should add to our list!